Acacia auriculiformis A.Cunn. ex Benth. is a perennial shrub having a wide range of medicinal potentials and is widely distributed throughout the world. It is being used traditionally to overcome various medical complications like sore eyes, aches, rheumatism, allergy, itching, and rashes. Besides, Acacia auriculiformis has been proven for many pharmacological activities like central nervous system depressant activity, antioxidant, antimicrobial, antimalarial, anti-filarial, cestocidal, antimutagenic, chemopreventive, spermicidal, wound healing, hepatoprotective and antidiabetic activity due to its low toxicity (LD50 = 3 741.7 mg/kg) and high efficacy. In addition, various phytochemical investigations reveal the presence of chief constituents as flavonoids (Auriculoside) and triterpenoid saponin glycosides (acaciasides- acaciaside A & B) in different parts of this plant. Since many years researchers have been carrying out various studies on this medicinal important shrub to elicit the various biological activities. This review attempts to highlight the pharmacognostical, phytochemical and pharmacological observations from 1965 to 2018 retrieved from SciFinder, Scientific journals, books, Google Scholar, and botanical electronic database websites. The various plant extracts evaluated for different pharmacological activities showed significant efficacy. Bioactive phytoconstituents isolated from various parts of the plant are highlighted. Pharmacognostical standardization of the plant done with various standard parameters is also reported. The low toxicity of this plant and the presence of major bioactive phytoconstituents like flavonoids and triterpenoid saponin glycosides are responsible for a therapeutic remedy for various diseases and pharmacological activities respectively. This review provides exhaustive information about the pharmacognostical, phytochemical, and pharmacological investigations of Acacia auriculiformis till date. Objective: To evaluate the antibacterial activity and neuroprotective capacity of the ethanolic and aqueous extracts of Tarenaya spinosa (T. spinosa) as well as to determine and quantify some of its polyphenols by high performance liquid chromatography with diode-array detection (HPLC-DAD). Methods: The bacterial Escherichia coli, Staphylococcus aureus and Pseudomonas aeruginosa strains, grown in Heart Agar Infusion, were tested. The drugs gentamicin, norfloxacin and imipenem were used to evaluate the modulating or antagonistic capacity of the T. spinosa extracts. The extract was analysed by HPLC-DAD to determine the main phenolic compounds. For the cell viability tests, individual heads of the Nauphoeta cinerea arthropod model were removed, homogenized in Trifluoromethyl ketone and centrifuged afterwards. 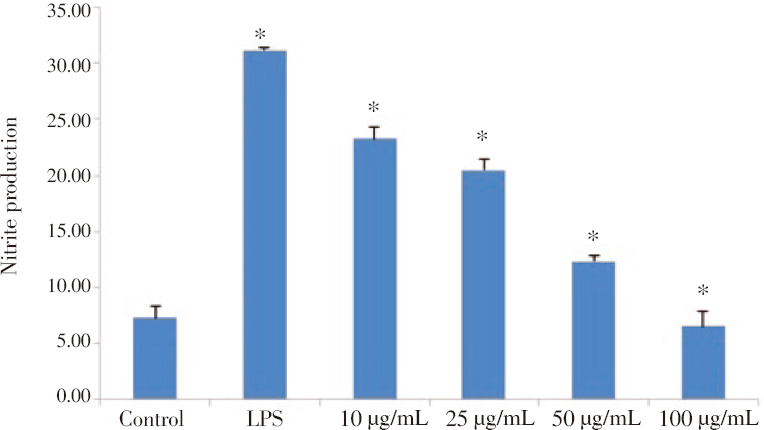 Subsequently, 20 μL of NaNO2 were added to the biological material, except in the control group, to evaluate the protection capacity of the extracts. The homogenate of the insect heads was incubated for 2 h in tubes containing tetrazolium bromide. Results: HPLC-DAD demonstrated that the ethanolic extract of T. spinosa presented caffeic acid as the major compound. The ethanolic extract also showed neuroprotective effects at concentrations ≥ 10 μg/mL, while aqueous extract was shown to have a protective effect only at the concentration of 100 μg/mL. The aqueous extract demonstrated a clinically relevant antibacterial activity against the Staphylococcus aureus multidrug resistant strain - MDR, with MIC 512 μg/mL. However, when the extracts were associated with gentamicin and imipenem, a synergism was detected against Staphylococcus aureus and Escherichia coli MDR strains. Conclusions: Although it does not present an antibacterial action, the extracts of T. spinosa can be used in the pharmaceutical industries since its extracts show modulating action of drugs. Besides, these natural products have neuroprotective capacity. Objective: To examine the in vitro and in vivo anti-inflammatory effects of the alkaloid enriched extract (ELA) from the roots of Eurycoma longifolia. Methods: The in vitro antiinflammatory effects of ELA were evaluated by examining its inhibitory activities against nitric oxide (NO) production and inducible nitric oxide synthase (iNOS) and cyclooxygenase 2 (COX-2) expressions in lipopolysaccharide (LPS)-stimulated RAW264.7 cells. The level of NO produced in the culture media was determined by Griess method. The iNOS and COX-2 protein expressions were analyzed by Western blot. The in vivo effect of ELA was evaluated on LPS-induced septic shock in mice model. Mice mortality was monitored for 5 days after injection of LPS. The chemical contents of the ELA were determined by using various chromatographic and spectroscopic techniques. Results: The ELA was found to exhibit a significant anti-inflammatory effect in both in vitro and in vivo models. The results demonstrated that ELA dose-dependently inhibited LPS-induced NO production as well as the protein iNOS and COX-2 expressions. In the septic shock model, ELA dose-dependently protected mice from LPS-induced mortality. Further study on the isolated components of ELA indicated that 9,10-dimethoxycanthin-6-one may contribute significantly to the anti-inflammatory effects of the extract. Conclusions: These results suggest that ELA exhibits the anti-inflammatory activity via suppression of pro-inflammatory mediators such as NO, iNOS, and COX-2 and protects mice from LPS-induced mortality in septic shock model. Objective: To investigate the in vitro antiproliferative action of essential oil from Salvia officinalis L. (S. officinalis) grown in Sicily (Italy), and its main components on hormone-dependent cancer cell lines. Methods: S. officinalis essential oil was prepared by hydrodistillation. The actions of the S. officinalis essential oil and its three principal components ( α -thujone, 1,8-cineole and camphor) were evaluated in LNCaP cells (prostate carcinoma), MCF7 cells (breast carcinoma) and HeLa cells (cervical carcinoma) at various dosages and diverse time points. Cell viability and proliferation were estimated using the 3-(4,5-dimethylthiazol-2-yl)-2,5-diphenyltetrazolium bromide assay. Results: S. officinalis essential oil at doses of 100 μg/mL and 200 μg/mL induced a significant reduction of cell viability in MCF7, LNCaP and HeLa cell lines after a 48-hour incubation. The same cell lines also showed decreased cell viability when they were treated with a mixture of three major components of the essential oil, at doses of 100 μg/mL and 200 μg/mL, after a 48-hour incubation. Conclusions: These preliminary results could shed light on the formulation of new therapeutic agents with antiproliferative activity. Thus supplementary investigations are fundamental to examine the molecular mechanisms of the anticancer effects of this species of Salvia in cancer cells and to achieve confirmation of its in vivo anticancer activity. Objective: To investigate the efficacies of 12 essential oil (EO) formulations from three Zingiberaceae plants (Alpinia galanga, Curcuma zedoaria, and Zingiber cassumunar) individually and in combination with an augmenting Eucalyptus globulus (E. globulus) EO against females of Aedes albopictus (Ae. albopictus) and Anopheles minimus (An. minimus). Methods: These formulations were evaluated for their ovicidal, oviposition deterrent and adulticidal activities against Ae. albopictus and An. minimus by a topical method, a double-choice method and a WHO susceptibility test, respectively. Results: It was found that all formulations of Zingiberaceae plants EOs augmented with E. globulus EO were more effective in oviposition deterrent, ovicidal, and adulticidal activities against the two mosquito species than all of the formulations used without E. globulus EO. Their oviposition deterrent, ovicidal and adulticidal activities were equivalent to those of 10% w/v cypermethrin. In contrast, 70% v/v ethyl alcohol as a control alone was not effective at all. The highest synergistic effect in effective repellency against Ae. albopictus was achieved by 5% Alpinia galanga EO + 5% E. globulus EO and against An. minimus was 5% Zingiber cassumunar EO + 5% E. globulus EO. Moreover, the highest synergistic effects in ovicidal activities against Ae. albopictus and An. minimus were achieved by 10% Zingiber cassumunar EO + 10% E. globulus EO and 5% Curcuma zedoaria EO + 5% E. globulus EO, respectively. For the adulticidal activities, the highest synergistic effect against two mosquitoes was achieved by 5% Curcuma zedoaria EO + 5% E. globulus EO. Conclusions: These results suggest that Zingiberaceae plant EOs augmented with E. globulus EO have a high potential to be developed into oviposition deterrent, ovicidal, and adulticidal agents for controlling populations of Ae. albopictus and An. minimus. Objective: To determine the role of toll-like receptor 4 (TLR-4) in eliciting cellular and humoral immune responses against recombinant Mycobacterium bovis bacille Calmette-Guérin (rBCG) expressing the C-terminus of merozoite surface protein-1 of Plasmodium falciparum. Methods: Six groups of mice (n=6 per group) were injected with phosphate buffered saline T80, BCG or rBCG intraperitoneally, in the presence or absence of a TLR-4 inhibitor; TAK-242. Enzyme-linked immunosorbent assay was carried out for serum total IgG, IgG1, IgG2a and IgG2b determination. Spleens were also harvested and splenocytes cultured for determination of intracellular cytokines; IL-4 and IFN-γ via enzyme-linked immunosorbent assay. 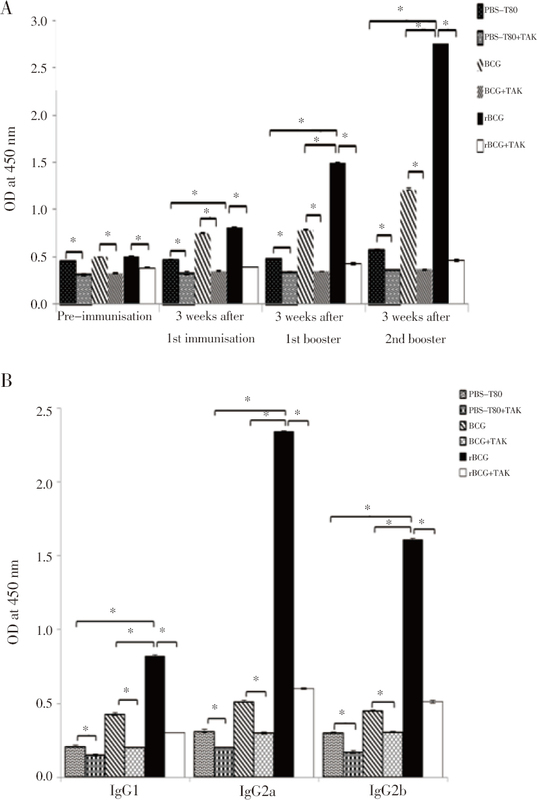 Results: The production of total IgG, and the subclasses IgG1, IgG2a and IgG2b was significantly higher in rBCG-immunised mice than BCG and phosphate buffered saline immunised mice in the absence of TAK-242. A significant rise in total IgG occurred with more booster immunisations. The level of IgG2a was highest, followed by IgG2b, then IgG1. The production of both IL-4 and IFN-γ was also highest in the rBCG immunised groups. These significant rises were inhibited in the presence of TAK-242. Conclusions: We present evidence of the role of TLR-4 in the increased production of total IgG, IgG1, IgG2a and IgG2b, as well as IL-4 and IFN-γ in response to our rBCG construct.